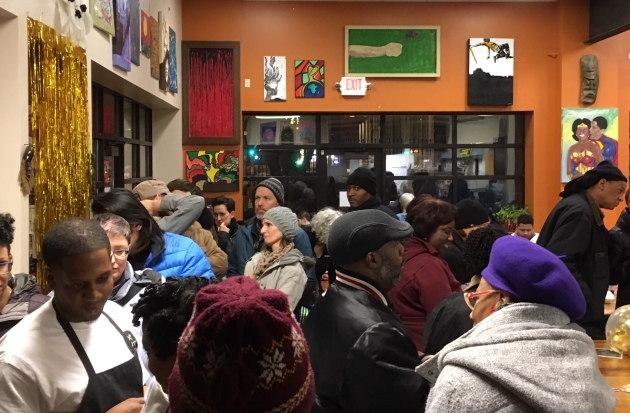 It was a packed house on Wednesday evening at Breaking Bread Cafe & Catering (1210 W. Broadway Av., Mpls., 612-529-9346), and the draw was oxtails. And cornmeal tempura walleye fingers, fried chicken, smoked brisket, collard greens, gumbo, red beans and rice, cornbread, banana pudding and sweet tea. The popular pop-up event — titled #WHERETHESOULFOODATMPLS — is the work of Onyx Culinary Collective, a recently formed group of eight Twin Cities African-American chefs and food enthusiasts. More than 100 people showed up -- and ate well -- on a snowy Wednesday night. The event continues Thursday and Friday, from 5 to 10 p.m. Is this a restaurant in the making?